Electric model aircraft are generally very quiet, so it’s somewhat ironic that one of the biggest problems in electric flight is noise. However, we aren’t talking about the noise that you, I, or our flying field’s neighbors hear. Instead, it is electrical noise, which is only heard by the electronic equipment in our planes, which is the source of potential problems. Just like audible noise is any unwanted excessively loud sound, electrical noise is unwanted excessively strong electromagnetic radiation. Just as audio noise can make it difficult to hear what we want to hear (such as our conversation partner in the midst of a crowd), electrical noise makes it difficult for our plane’s radio receiver to "hear" the signal from our transmitter. The very first radio transmitters, such as the one used by Marconi to transmit the first signal across the Atlantic Ocean, consisted of the equivalent to an automobile ignition coil and a spark plug. Whenever a spark was generated, electromagnetic waves were created. When these waves crossed a wire (such as an antenna), a current would be induced into the wire, and a headphone attached between the wire and the ground would emit a slight burst of static. A brushed electric motor as used in many of our planes is basically a whirling collection of ignition coils and spark plugs (see How Motors Work). As the motor’s armature turns and different windings are energized and de-energized, sparks are generated between the commutator and the brushes. A perfect motor, with infinitely small brushes and commutator gaps, perfectly timed for the load and speed it is being used at, might possibly not produce any sparks, but any real motor will always exhibit some amount of sparking. Unlike a finely tuned transmitter, a spark will transmit across a wide range of frequencies, some of which are bound to coincide with 5 to 10kHz wide band used by a typical R/C receiver. If the magnitude of the noise at that frequency is much higher than that of the signal the receiver is supposed to receive, then the receiver will have trouble picking out the signal from among the noise. Furthermore, since the source of the noise is so close to the receiver, it can also affect the intermediate stages of receiver, thus causing interference even if none of the noise coincides with the receiver’s frequency. In addition to the noise created by the way the motor works, more noise can be created by the on-off switching of the electronic speed control (ESC) at partial throttle. The most obvious symptom of a noise problem is jittering control surfaces, especially at partial throttle where throttle switching noise is added to the motor noise. Even if your servos are rock-steady at all throttle settings during a bench-test, you could still be suffering from a noise problem which only shows up at longer range. For example, an antenna-down range check might normally give reliable operation up to 100ft (30m) away, but only up to 20ft (6m) with the motor running. At close range, the signal is strong enough to be heard above the noise, but as the signal weakens, the noise drowns it out. Noise from the motor can get into the receiver in a number of ways, but they all boil down to some combination of two methods: radiation and conduction. One way for motor noise to get into the receiver is the same way that the transmitter signal gets there, namely by electromagnetic radiation (don’t worry, although the same word is used, this is not the same thing as nuclear radiation). Electromagnetic waves created by the sparking in the motor will travel through the air, and will be picked up by the receiver’s antenna or by components of the receiver. The other way for noise to get to the receiver is by conduction. Since the motor is connected to the ESC, and the ESC is connected to the receiver, it is not surprising that some electrical noise can flow through wires and components to get all the way to the receiver’s reception circuitry. ESCs with a battery eliminator circuit (BEC) are theoretically more likely to cause noise problems, because not only is the ESC connected to the receiver, but the receiver gets its power from the motor battery (through a voltage regulator). Any noise conducted from the motor back to the battery might make it through the voltage regulator and into the receiver. In practice, effective filtering built into most BECs makes this a non-issue. ESCs with optical isolation prevent conduction of noise directly from the motor to the receiver by not having a direct connection between the two. Instead, the signal from the receiver controls an optoisolator chip, which transfers the signal to the rest of the ESC via an optical (LED and phototransistor) connection. Most cases of interference caused by electrical noise are not just simple cases of radiation or conduction. Instead, a combination of factors is usually involved. For example, electrical noise could flow from the motor, along the wires through the ESC, back to the motor battery. The battery (and the motor wires) can act as an antenna, radiating the noise. This might then be picked up by a servo lead, which conducts the noise into the receiver. To stop electrical noise from interfering with reception, we have to determine how the noise is getting from the motor to the receiver, and then how to reduce the noise level to the point where it’s low enough that the receiver can reliably detect the intended signal from the transmitter. A motor with poorly fitting, pitted, or cracked brushes will also produce more sparks, and hence more electrical noise, than one with smooth well-seated brushes. Whenever you purchase a new motor, or install new brushes, run the motor for a few hours with no load at a low voltage to properly seat the brushes (some motors have had this done at the factory, but it still needs to be redone if you replace the brushes). Even a motor in perfect condition will produce some electrical noise, so some form of filtering is needed to keep that noise from getting to the receiver. The simplest filters consist of one, two, or three capacitors, as shown in Figures 1 to 3. Figure 1. A single-capacitor filter. 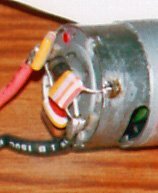 The capacitor is simply soldered across the motor terminals. A capacitor is an electronic component that will conduct only currents that are changing at a high frequency. A single capacitor wired across the motor terminals will act as a short circuit for high-frequency electrical noise, while not affecting the power to the motor at all. This reduces conduction of noise along the motor wiring. Figure 2. A two-capacitor filter. Each capacitor has one lead attached to a motor terminal, and the other lead attached to the case. When two capacitors are used, each one is connected between the motor casing and one motor terminal. This has the effect of shorting the casing and terminals together from the noise’s point of view. Including the casing in the circuit will reduce radiated noise by making the casing a shield. Figure 3. A three-capacitor filter. This is basically a combination of the one- and two-capacitor circuits. Photo 1. A typical three-capacitor filter installation on a ferrite motor. These particular capacitors are older style high-voltage ones; newer ones would be smaller. The black cylinder is the ESCs freewheeling diode. The three-capacitor filter is just a combination of the one- and two-capacitor versions. One capacitor is connected across the motor terminals and one is connected to each terminal and the motor casing. This is the filter that I use on all my aircraft, and I’ve only had noise problems once (which turned out to be due to an out-of-tune receiver). I use a 0.1µF (micro-Farad) capacitor across the terminals, and a 0.047µF capacitor between each terminal and the case. Photo 1 shows the capacitors installed on a motor. When using a high-rate ESC (which all modern ESCs are), never use electrolytic capacitors for noise filtering. The high switching frequency from the ESC will cause such capacitors to explode. Always use ceramic disc or similar capacitors. 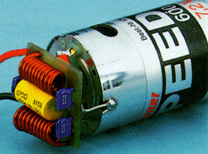 Some motors, such as the Graupner Speed 400 series, come with a two-capacitor filter already installed inside the motor. Additional filtering is often not necessary, although it would do no harm. Another method of noise filtering is to loop each motor lead several times through a ferrite ring or bead. One or more such loops of wire, either around a ferrite core or just in midair, is called a choke. A choke is the opposite of a capacitor, in that it will conduct only low frequency signals (such as the power to the motor), while blocking higher frequencies. It is possible to construct more elaborate filters using multiple capacitors and chokes. Since chokes conduct motor power and block noise, they are wired in-line with the power leads instead of across the terminals. Figure 4 illustrates a capacitor-choke filter, and Photo 2 shows a commercially available unit sold by Graupner. Figure 4. A capacitor-choke filter. These are usually assembled on a separate circuit board which is then soldered to the motor terminals. Photo 2. A capacitor-choke filter sold by Graupner, designed to be soldered directly to any 05-sized can motor, such as a Graupner Speed 600. Graupner also sells a Speed 400 sized filter. High-rate ESCs make use of a Schottky diode for more efficient operation. At part throttle, during the time that the ESC’s MOSFETs are switched off, the diode serves to recirculate motor current. Most ESCs have an on board diode, but some might require you to solder the diode across the motor terminals (with the banded end towards the positive terminal). Do not omit the diode in this case, as it will result in reduced efficiency and increased noise. If your ESC has a diode on board, you should still install one on the motor if the ESC is far from the motor, or if you are operating more than one motor from one ESC. Schottky diodes are available at most hobby shops that carry R/C car supplies. Any filtering should be done close to the motor, preferably right at the motor terminals. If the filtering is done further away from the motor (e.g. at the ESC output), then the noise must travel along the motor power wires before reaching the filter. The wires would then radiate the noise. Filtering is designed to stop conducted noise (and hence indirectly, radiated noise). Shielding on the other hand is designed to stop radiated noise. If you’ve ever attempted to operate a transistor radio or a cellular phone inside a metal-clad building, you will have witnessed the effects of shielding. There are a number of things that can be shielded in an electric flight system. One is the receiver. Many modelers have solved their electrical noise problems by wrapping the receiver in aluminum foil, with only the antenna sticking out. This way, the only way for a signal to radiate into the receiver is via the antenna, and thus, only signals within the receiver’s frequency range will be accepted. When a wire runs a long distance in the presence of electromagnetic radiation, the wire acts like an antenna, and the radiation induces a current in the wire. If there is a source of radiated electrical noise nearby, then the wire will turn this into conducted noise, and conduct it into whatever it is connected to (for example, a long servo lead connected to the receiver). When more than one wire is involved, as in a 3-wire servo lead, noise pickup can be dramatically reduced by twisting or braiding the wires. Two or more parallel wires will pick up a level of noise depending on how far they are away from the source and from each other. The distance between the wire causes a voltage difference between them, and hence current flow. By twisting them, the wires take turns being closer to the noise source, and the voltage difference in one section will be of opposite polarity to the voltage difference in the next section, resulting in a cancellation of the noise along the wire as a whole. Just as twisting servo wires together can reduce the pick up of radiated noise, twisting power wires together can reduce the amount of noise radiated by the wires in the first place. This is especially important with long power wires, such as those feeding wing-mounted motors. The amount of twisting need not be excessive. One full twist every 2 inches (5cm) or so is more than adequate for power wires. Servo wires, being thinner, are easily twisted several times per inch. I prefer to separate the three wires of a servo lead and then braid them together, since this can’t undo itself like a twist can. Twisting wires for interference reduction is discussed in more detail in my 2004 article, Let’s Do the Twist. Even with the most elaborate filtering, shielding, and noise cancellation, you can still suffer a noise problem if the motor or power wires are too close to the receiver or servo leads. For example, if the receiver were placed right next to the motor, or if a servo lead were to pass around the motor, you would very likely have a noise problem. To prevent such problems, keep the receiver, servos, and associated wiring as far away as possible from the motor, ESC, and battery. On a multi-motored aircraft with long power wires and long aileron servo leads, keep them as far from each other as possible. When wires must come near each other, try to have them cross at right angles to one another. So, how far do you have to go to prevent electrical noise problems? In general, not very far. If you equip your motor(s) with a typical three-capacitor filter, time it properly, and keep your power wiring away from you receiver and servo wiring, you shouldn’t have any problems. A range check with the transmitter antenna down should provide reliable servo operation at half-throttle from at least 80% of the distance you get with the motor off. With my JR radios, I can get 100ft (30m) even with the motor running. If you get poorer range, you may have to resort to more drastic measures such as a more complex filter, shielding, rearranging your equipment to increase separation, or using an ESC with an optoisolator. If these tactics still don’t help, consider having your transmitter and receiver checked by a qualified technician. I once had a radio that would glitch horribly with the motor running, even at very close range. It turned out that my receiver was out of tune, and thus barely detecting the signal from the transmitter. The addition of a bit of motor noise drowned it out almost completely. I found this to be very useful. Thank you. Is this noise cancellation also going to work for brushless motors? No, these techniques don’t apply to brushless motors. However, brushless motors don’t have brushes, so they don’t generate much electrical noise, and interference reduction isn’t really needed. Just a thought…when you must run long power wires, use a miniature stranded coaxial (shielded) wire for + and – and then do the 3 capacitor arrangement and tie the shields to the motor case as well. Mark, that may work, assuming you can find shielded cable with a thick enough centre conductor for the amount of current you will be drawing. I have a question, i am doing a project where the controller is a PIC MCU, i have several solenoid valves (inductive load), i noticed that sometimes the system resets itself, this causes problems, any ideas; i have used free wheeling diodes on the coils of the relays control the AC solenoid valves, also, multi layer capacitors on the coil, and opto isolater between the MCU and the relay driver circuits??????????????????????????????? Mohammad, are the relays being powered by the same power supply as the MCU? Perhaps the power supply can’t handle the surge of the relay energizing, and the voltage thus drops briefly. a very important topic for me as beginner in rc system,thanks. Ernesto, although it’s still an important topic, it’s less of an issue these days due to brushless motors being less electrically noisy. You say that this is less of an issue with brushless motors. Is there any harm in putting filters on a brushless motor? Could it provide a small benefit? Do ESC’s cause their own noise with their switching? Is there a method filtering an ESC? With FPV, you have a video transmitter on board, perhaps that could benefit from power filtering as well? Thanks a lot for your informative article. I have a project on Wiring or Cabling technique in reducing EMI in aircraft. I am using an old JR X2610 radio system at 35.020 Mhz. Power for the receiver is coming via the throttle wires coming from the CC3D. When the quad is 20-30 meters out it start to jitter and shake and flip erratically and eventually falls out of the air. I then switched to an even older FUTABA radio system at 35.200 Mhz with exactly the same result. – Should I use a separate power supply for the radio receiver? – I have ordered a 2.4 Ghz Radiolink radio system. I ended up here while looking for help with a weird problem I was having: right aileron would make the motors on my DC3 glitch on/off running just above “idle” speed. I tried all kinds of things and couldn’t get it to go away. I thought as a last resort I was going to have to cut into the foam wing and move the escs close to the receiver (make the motor leads long instead of the power leads and twist all the leads). But before I did that I put everything back as it was with a new receiver that hadn’t worked previously. But once I did the bind procedure again the problem went away. So, long winded way of saying try binding your receiver to your transmitter a couple of times if your having noise symptoms. Thank you for providing this page.